In the process of studying about samplers over the years, I've come across many facts and many fanciful ideas. I hope to provide many of the facts here and perhaps dispel some of the fancy. Whenever possible I will list resources to back up the facts, and welcome any additional information from you to either substantiate these facts or to refute them as new information comes to light. The one thing I know for sure is that the theories about samplers, their makers, and the stories surrounding both, will continue to change as more people do further research. 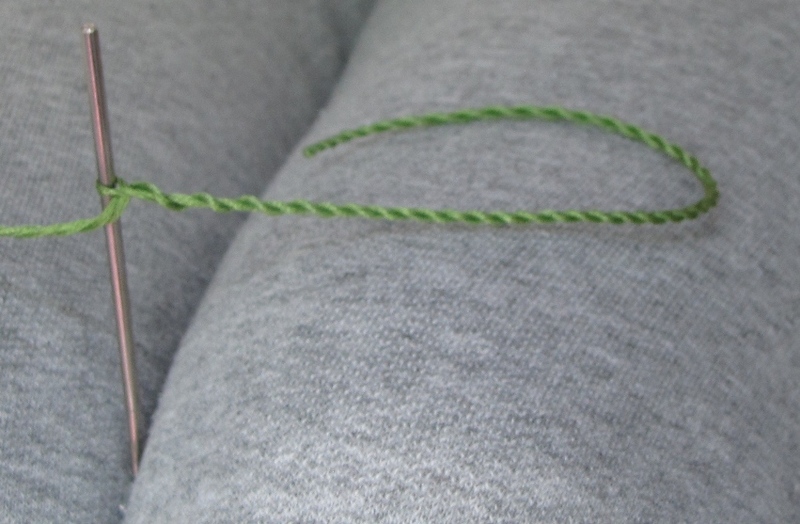 There are a number of excellent sources of instructions for creating twisted cords, mostly using cord-twisting devices. But invariably I find a need for a short cord that I need to make quickly. I only have my two hands available, and always wish I could just attach that third (or fourth) hand where it would be convenient! So I've developed a couple of tricks which help when I want to make some cord (or even just twist some of my own silk threads). My favorite tool is a "third hand" which is available from Clotilde (see links below). 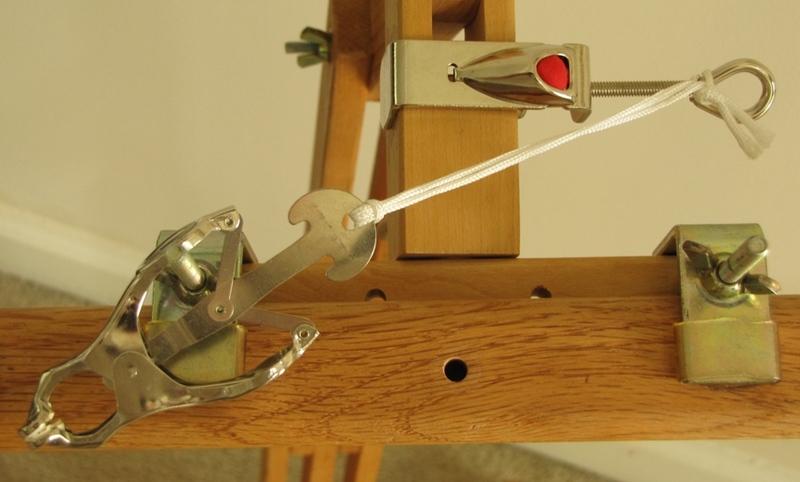 It is a small squeeze clamp with a textured rubber "mouth" which is attached to a clamp that can be put on the edge of a table, or on your needlework frame stand like I do. The only drawback to it is that the squeeze clamp part is attached to the table clamp with a short cord so it moves - helpful for some applications, but not twisting cords. I just anchor that part of it over one of the frame bolts on my needlework frame stand so it keeps the clamp from twisting when I'm twisting the cord. My second method is more portable, but requires a little bit of knee action - probably not as good for working the thigh muscles as a thigh buster, but I imagine it does a little bit of good! Anyway, you also need a crochet hook, knitting needle or some kind of smooth stick. 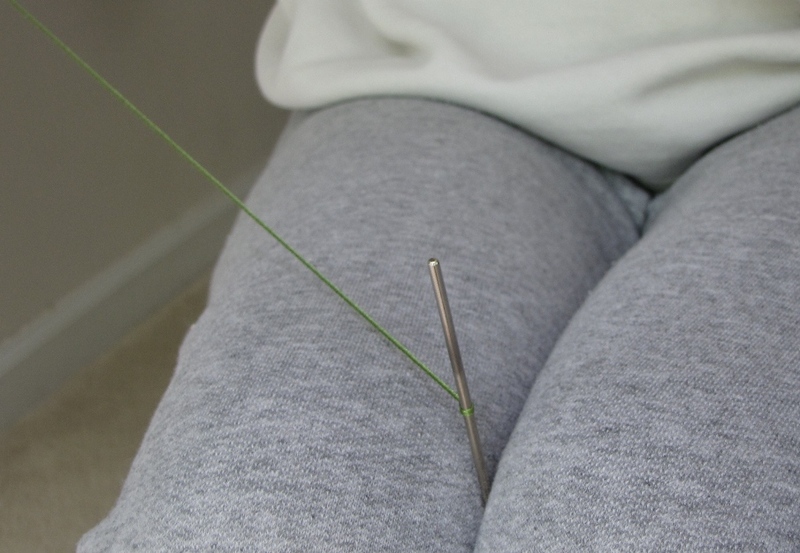 Sit with your knees held tightly together with the crochet hook between your knees, blunt end sticking up. 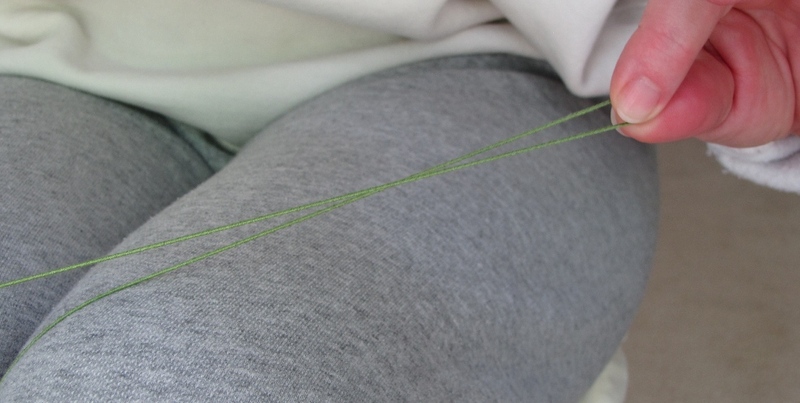 Put the folded end of your cord around the end of the crochet hook, and twist the loose ends. You can now easily grab the middle of the length of twisted fiber and keep tension on the whole thing while you bring the ends back to meet the loop over the crochet hook. Using the hand that grabbed the middle section, you then twist the opposite direction while keeping tension on the whole thing, just enough to get the twisting action started smoothly. Then just lift off the part on the crochet hook and tie the ends in a knot to hold the twist. Easy, quick, and only limited by the reach span of your arms. Another option when you need a slightly longer cord, but don't want to get out that drill, is to have a cup hook mounted somewhere convenient (like under the edge of a counter). I even saw a key rack at Target recently with 4 small hooks already in a piece of painted wood that would be ideal to use, and you could have a safe place for your keys when you're not twisting cord! 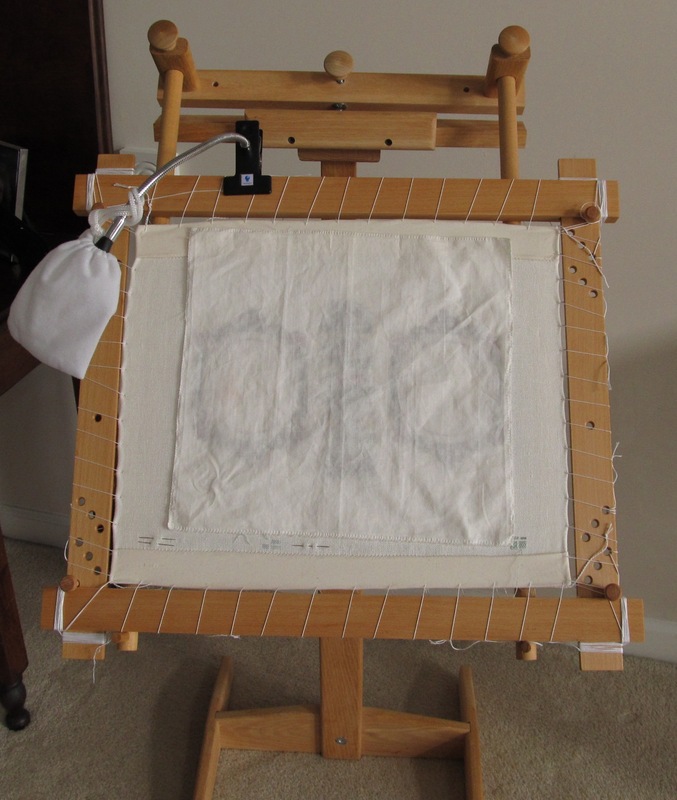 Years ago when I did more canvas work I found a very lightweight needlework stand which was easy to take apart, and also easy to adjust. I no longer use it for holding my needlework frames while I'm working - instead I've re-engineered it to be my "anchor" point for my magnifiers and third hand (mentioned in my other hints). I don't know who made this stand, but I did see a similar one recently in Keepsake Needlearts catalog. 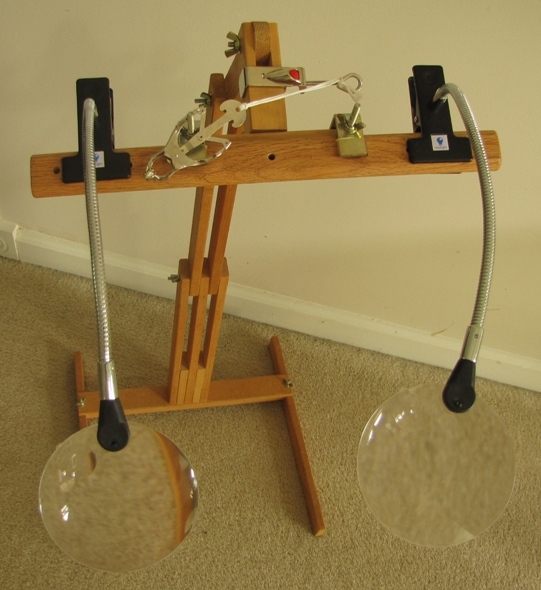 It is a little heavier weight and has different types of attachments for the frames, so you'll have to play a bit to get your magnifiers set up. I modified mine by using the clamps to hold a bar from a stretcher frame set I also don't use often. Then on that bar I can clamp my magnifiers, small lights, or anything else I need handy. My third hand clamps on to the main support of the frame stand, and I use one of the bolts to anchor it so it doesn't twist when I'm making twisted cord or twisting flat silk to make my own threads. Oh, and the bolt ends that stick up from the frame clamps turn out to be perfect for holding spools of metal passing thread when I'm doing Elizabethan corded Brussels punto in aria. The stand is easily moved out of my way, slips under the edge of the sofa, and can be adjusted so I have just the right working angle for almost anything I'm doing. For the past few years I've been working more and more projects on slate frames (or a modification of that). I prefer a well made slate frame, but if I need a quick solution for a smaller project (under 12x12), I will make use of those needlepoint frames that slot together at the corners. The lacing isn't quite as snug over a long period, but it works in a pinch, and I can usually hold these in my hand while I work, or prop them on my small needlework stand shown above. However, when I'm working with my larger slate frames I found I needed a better solution for holding the frame than trying to prop it up on a table edge (which wasn't handy in my family room), or on my knee (leg cramps resulted frequently). I remembered an old needlepoint frame stand which I'd bought years ago (15-20 years? ), but found cumbersome at that time. It is designed to hold the frame parallel to the floor, and that means I'm bending my neck and back, which I find very uncomfortable. But it is slightly portable, so I thought it was worth a second look and I brought it out of it's storage spot in my workroom. I modified it by reversing the adjustable side bars so instead of them being flat, I folded "back" the hinges to make the bars angle down at about a 60-75 degree angle. And I raised it so the bottom of the pegged bars sits just above my lap. This lets me balance my frames on these pegged bars, so the frames aren't attached. Whenever I need to flip the frame over to tie off threads, it's very simple. I can turn the frame at just about any angle and have it supported on these bars, so I can get just the right angle on my needlework. 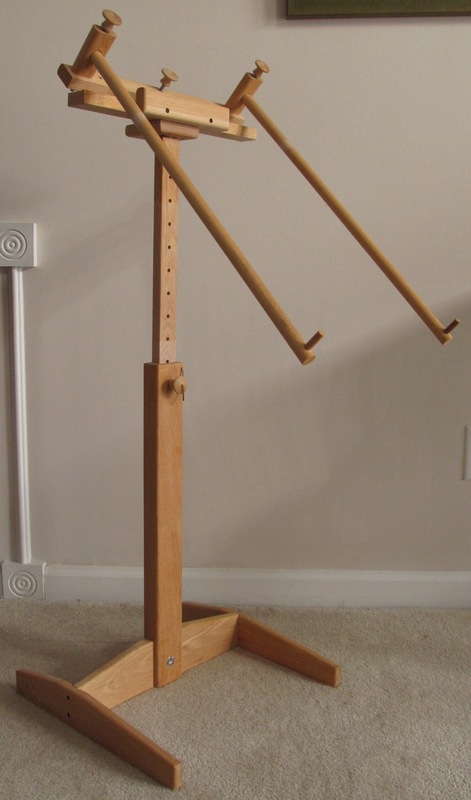 Since the side bars are wooden dowels, and they can swing at various angles side to side, I just move them closer together to support smaller frames, and spread them apart to work with larger frames. The little pegs at the bottom keep my frames from sliding off. And the angle of the bars holds my needlework almost upright in front of me, so no more sore neck and upper back from bending over my work. I do not remember who made this stand, and I've looked far and wide for another like it. I'd love to find who did, and perhaps work with them on some modifications that would make this even more flexible. Hope these pictures help you get an idea of how I make this work. 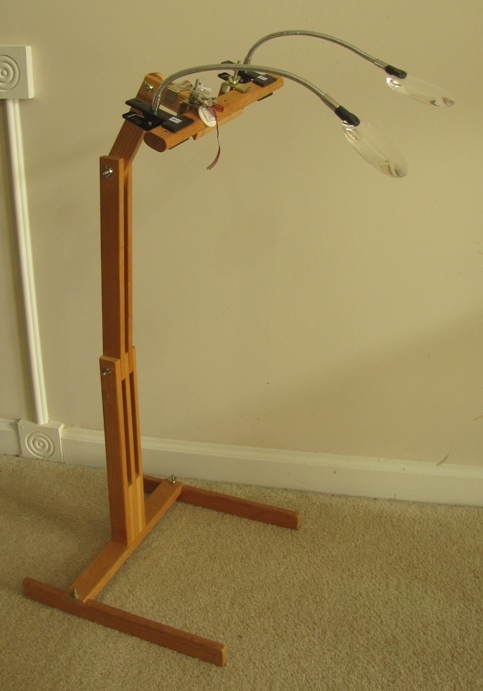 You may have a similar frame stand, and just need to look at it in a different way! My biggest disappointment as I get older is my ever increasing need for more magnification when doing needlework. I don't like magnifiers that hang around my neck, and don't have a convenient place that can handle the weight of larger magnifiers where I sit to do most of my stitching - plus those can be a pain to carry around when you're traveling! I also don't always need the same magnification on every project - sometimes more and sometimes less. I've searched for magnification options in a variety of sources including scientific supply houses. Finally I've got a solution that works quite well for the majority of my needlework needs. First you have to understand a simple part of how magnifiers work. The lens is created to increase the size of what you are looking at when it is held a certain distance from the object, and a certain distance from your eyes - called the focal length. The higher the magnification listed (5x versus 2x), the closer you have to be to the object both with the magnifier and with your eyes! So, if you have basic reading glasses that are 1x magnification you can probably read something held about 18" away from your face. But if you have to use 2x magnification glasses you probably find you have to hold things closer to your face. I'd love to have 10x magnification for a lot of my needlework - but I'd have a very tiny lens to look through, causing me to squint with one eye, and I'd have to hold it practically under my nose which could be dangerous when I'm using a needle! Okay - how to solve this problem? I discovered that if I use my "normal" reading glasses, which are 1.5x magnification, they worked nicely for my most comfortable stitching distance, as long as the linen count was fairly low. But if I needed to work at 36 count or higher, this didn't work so well. 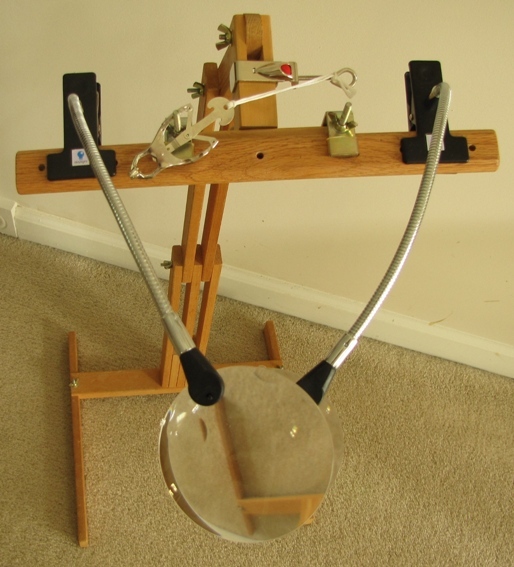 However, I have a small clamp-on magnifier with a 10" arm (Flexi-lens) which I can clamp on to my needlework frame stand and get it about half-way between my needlework and my eyes, and the combination of the reading glasses and this magnifier gave me higher magnification than either one by itself. You have to play a bit to get the combination just right - distance from your glasses to the magnifier and the magnifier to the needlework. But it's worth it when you can do more work for a longer period and really see it! It's also fairly easy to travel with it. Still didn't solve the need for higher magnification for tiny work. So I got the bright idea one day to use two of these magnifiers - after all, if one is good two must be fabulous, right? Yay! It works - again with a little adjusting, you can layer magnification, in effect multiplying it - so I'm often using reading glasses (either 1.5x or 1.75x magnification), plus two of these clamp-on magnifiers about 1 to 1-1/2" apart. And it's light-weight, easy to work around, easy to travel with, and fully adjustable. With the set-up I have I can use one or both, and easily move them to whatever angle I need. Every spring as the leaves come out on all the trees, I have often wondered why I find so many small branches of new growth littering my yard. At times I've just assumed it was due to high winds, or perhaps a weakness (hopefully not a disease) in the trees. In early May, I noticed a clump of leaves up in one of my oak trees, and a small squirrel scampering in the same tree. As I watched, the squirrel would move from the clump along a nearby branch, chew off a small branch of leaves, balance it in its mouth and take it back to the clump, tucking it in place. The squirrel was quite skinny so I don't know if it was male or female, but it was obviously building a nest. At times the branch of leaves would be too much to handle (even squirrels bite off more than they can chew), and it would drop to the ground. Aha - the source of my spring ground litter became obvious. I think the squirrel is now finished with the nest - at least I don't see any more of the building activity. The clump of leaves is quite large - probably two to three feet in diameter, resting on several larger branches next to the trunk of the oak tree. Some leaves that dangle from it are starting to wilt, and I suppose they will all begin to lose their bright green color in the weeks to come. 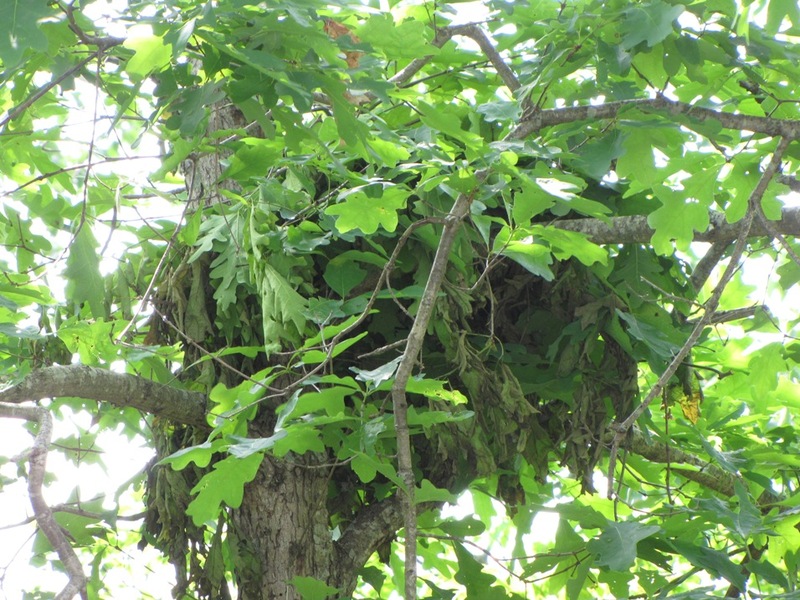 I don't know how long a squirrel's nest is used - I typically have never noticed them until the fall when all the other leaves drop. Most people probably think they are just fallen branches of leaves that got stuck up in a tree - I know I did. But I wonder about the structure of the nest - how does the squirrel keep it all together and how does it survive the high winds of our famous spring storms? Maybe my interest in the construction techniques of the squirrel nest is heightened because I spend so much of my time trying to figure out, or mentally deconstruct, the various stitch techniques of needlework from earlier days. Watching the squirrel build this nest let me have some insight into how it is done, though without a view from above the nest it is still not clear how it holds together or if it is open at the top. With needlework often only partly visible in photographs, or through the glass of a display case it is equally hard to decipher the construction techniques. I wish I had the ability to time-travel and sit and watch how young girls, or men and women in the trade, did their work that we so admire today. Wouldn't it be a thrill to be able to look through their "stash" of supplies, see what they had available and what they made themselves, and then watch how they put it all together to create the wonderful embroideries we study. As shown in a recent exhibit of embroideries from the Metropolitan Museum of Art, which are nicely documented in their exhibit catalog (truly a misnomer - "priceless reference book" would be a better description), there were fascinating uses of silk, gold, silver, beads, and other trinkets. In recent x-radiography being employed to study many of the raised embroideries, it was even discovered that an actual bird's beak was used for the beak of an embroidered bird! Many suppositions about the materials used, and how stitches were executed, have been brought into question. Some of the basics are still clear, but items can now be viewed with high resolution cameras and photos, along with the x-ray technology, thus allowing a new view into the art of embroidery, especially the true techniques behind the beauty. As early summer heat comes on, the leaves in the squirrel's nest are beyond wilting - they are becoming that pale yellow before they become brown. It is more obvious amongst the bright green leaves of the tree. I've been watching for some kind of activity around the nest, but rarely see the squirrel there. My curiosity is heightened by the fact that this nest is built just above the level I can view from my upstairs windows - how frustratingly "just out of reach" it is. 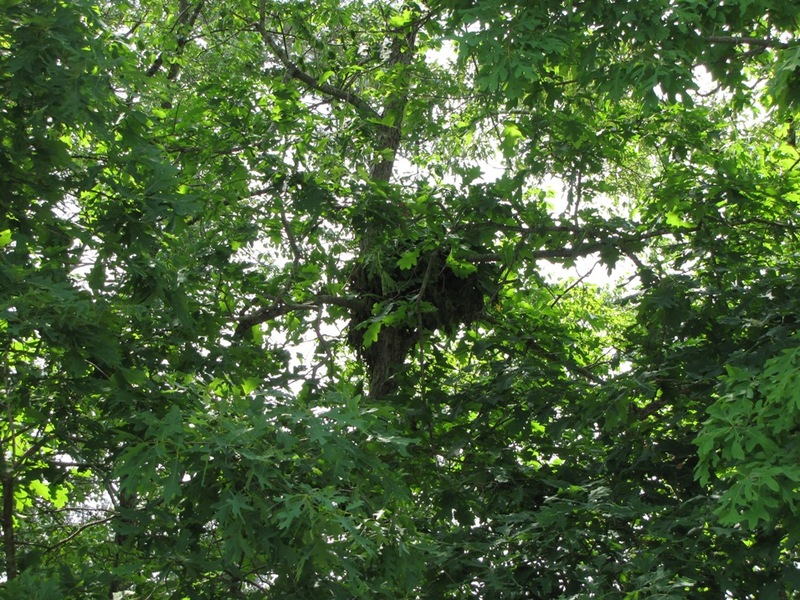 I've done some Internet research to find out about squirrel nests, and found that they are typically built about 20 feet above ground. Construction begins with a platform of twigs roughly woven together, upon which damp leaves and moss are compacted to form a solid base. A spherical skeleton of interwoven twigs and vines is erected around the base. The outer shell is then completed with the addition of leaves, moss, twigs, and even paper. The inner nest cavity is six to eight inches in diameter and is lined with shredded bark, grass, and leaves. This soft lining is especially important to cradle the delicate infants which weigh about half an ounce at birth and whose skin is almost transparent. Nests of gray and fox squirrels may measure up to two feet wide and a foot high. Red squirrel nests are proportionately smaller. Opposite the main entrance, the wary bushytail builds a leaf-concealed escape hatch. So despite its apparent flimsiness, it is actually a well-constructed and innovative bit of architecture. It also appears that squirrels may have two sets of babies - one in the spring and another in late summer. So now I'll watch to see if the squirrel I saw building the nest gets much fatter as the summer goes along! A few years ago I had the opportunity to hear two different lectures by Kathy Staples, in which she mentioned a connection between the appearance of elaborate rose motifs on samplers and the then "newly popular" hybridization happening in the world of rose horticulture. Being both a sampler lover and an avid gardener, I found this connection very interesting. Similar connections to the "latest" gardening craze have affected needlework, especially samplers, for many years. Flower shape played an important part in what showed up in embroidery. The double, or Tudor, rose (white for the House of York and red for the House of Lancaster) flourished in the decorative arts, especially embroidery, as did the moss rose which appeared in gardens in 1730, and soon after showed up in embroidery. Yet the single and double light yellow tea roses of the late sixteenth century did not appear in seventeenth century needlework. Field flowers (pansies, cowslips, primroses, columbine and cornflowers) brought into the garden from woods and meadows in the mid-sixteenth century also became the favorites in embroidery into the seventeenth century. Formerly the focus on plants had been for medicinal, culinary and cosmetic properties. Now they were being noticed for their extraordinary beauty, and were often described in terms of embroidery. One connoisseur, Lord Burghley, writes of sunflowers as having a middle "made of unshorn velvet" or cloth "wrought with the needle." The intense colors and jeweled appearance as well as a wide range of colors made daffodils, marigolds, columbines, roses and carnations popular in embroidery. The development of double flowers began during the end of the sixteenth century, and embroiderers followed suit making their flowers as showy as possible, utilizing needlelace and detached buttonhole stitches to create three-dimensional blooms, and eventually free-standing flowers. The embroiderer was not limited by the gardeners' problems in breeding, and flowers in embroidery became more and more novel, often not even resembling the real item. In 1724, Robert Furber's catalogue, The Flower Garden Display'd, promoted not only plants from his nursery, but designs useful "for the Ladies as Patterns for Working." Two editions of The Lady's Drawing Book, illustrated by A. Heckle, were described in 1785 as "an Extensive and curious collection of the most beautiful flowers…the whole adapted for the Improvement of Ladies in Needlework." As designs drawn on silk became readily available in the late eighteenth century, there was less adaptation from botanical illustrations. Then in the nineteenth century the prevalence of Berlinwork exactly coincides with the most active years of the nineteenth century florists. In a departure from the formal parterres and beds of carnations and tulips fashionable in the late 17th century, Joseph Addison had a garden resembling "a natural Wilderness". Soon this "natural Embroidery of the Meadows" caught on, and many gardeners adopted the informal planting. Embroidery reflected a similar change at this time, and slips and interlacing patterns gave way to a great "Luxuriancy and Profusion" of branches, sprays and garlands of flowers. This was mostly seen on embroideries used for upholstered furniture, or table and bed furnishings. Roses were in such high demand in the 17th century that they and rose water were used as legal tender, for barter in markets, as well as payment by the common people to royalty. In the late 18th century, cultivated roses were introduced into Europe from China. This caused the division in rose groups of "old roses" (cultivated in Europe prior to 1800) and "modern roses" (cultivated at the turn of the 19th century in England and France). Up until this time, all roses in Europe were shades of pink or white, with red roses coming from China around 1800 and bright yellow roses not showing up until around 1900. Cultivation of roses in the early 1800s took the numbers of roses from tens to hundreds of cultivars, with the height occurring in the 1820s. The most striking change in rose history occurred between the 1830s when cultivation between the European roses and Oriental repeat blooming roses increased, and the 1840s when the "Hybrid Perpetuals" overtook almost all other groups. Around this time, interest in rose shows and competitions increased, and with it a "standardized" concept of what a rose blossom should look like. Tea roses (named because of their scent) were introduced to the west by the British in 1810 and 1824, and are considered by many to have the best color and form of all roses, but the blossoms were susceptible to weather damage, especially in England. Cultivation of roses was not restricted to England and France. Around 1800, in Charleston, South Carolina, a fragrant, pink rose was developed by John Champneys. A neighbor introduced the rose through his brother to France, and by 1825 there were more than a hundred varieties of this original rose (called a "Noisette"). Hundreds of new varieties of roses created a period of tremendous excitement for rose enthusiasts in the early nineteenth century, both in gardens and their use in embroidery. It is around this time that you begin to see the large, stylized roses and rosebuds appearing on samplers. Instead of being utilized in a band or border, they become more of a focal point for the sampler. 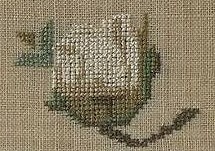 Often there would be a large bud or blossom worked over two threads, with the same bud incorporated in a stem of flowers done in over-one stitches in more detail. With the history of influence of gardening and flowers on embroidery, it is no surprise that the history of the rose is also tied to embroidery styles and patterns. Breeze, Mabel S. G., "Notes on the Origin of the Moss-Rose", Journal of the Royal Horticultural Society, Vol. XLVII, 1922. Dickerson, Brent, "Introduction and General History", Old Garden Roses and Beyond, 1999. "She was a woman of great endurance, though slender, and had a faculty for accomplishing work which was a marvel. She did not possess great physical force, but managed to accomplish no inconsiderable amount in rearing a large family and providing for their temporal and spiritual wants, clothing them, according to the custom of the time with the wool and flax of her own spinning. The raw material entered the house from the farm and never left it except as warm, durable garments upon the backs of its inmates … My mother had nine operatives at this time, of different ages, and not a drone among us all. All were busy with the little picking machines, the hand cards, and the spinning wheel, and the loom." My 5th-great grandmother, Elizabeth Spelman, was born in 1740 and married Lieut. Samuel Bancroft in 1759 just one month short of her 19th birthday. She lived to 96 years of age, and saw her husband, son and other relatives off to fight for American Independence. As stated in the quote above by my 4th-great grandfather, Azariah, she was well familiar with linen from field to fabric, and I suppose my love of linen could be genetic! In earlier times, each family grew flax and wove the linen for their own use in most countries, as did my ancestors. But the linen industry has existed for over 4,000 years. Fine linens found in Egyptian tombs were woven to 200 threads per inch. During Medieval times, linen was used for rope, clothing, towels and tablecloths, and was commonly woven in what is known as tabby ("linen") weave. However, there were also fancy twills, Huck, diaper, Damask and brocade weaves. Linen, yarn or fabric, is from flax (Linum usitatissimum), a vegetable fiber - in fact, it is the strongest of all vegetable fibers, which is why it has lent itself well to a vast number of uses throughout history. Because the stem of the flax plant contains the fiber, it is a bast fiber. The seeds of flax are often used for medicinal and nutritional purposes dating back to early Greece, as well as to make linseed oil. The plants decompose in acidic soils, but in Switzerland there are some alkaline bogs where evidence has been found of brightly colored linen woven by the Swiss Lake Dwellers in 3000 BC. A needle-netted linen headpiece from Nahal Hemar Cave in Israel from 6500 BC may be the earliest known example of preserved linen. Modern flax does not seem to grow as fine as it must have in medieval times, based on the finer linens that remain from that period. The more densely the flax plants are spaced and the poorer the nutrients, the more slender the plant and the straighter the stems. This combined with harvesting of younger plants produces a finer fiber. Flax is harvested by pulling the plant up by the roots or cutting it near the base of the plant, and then the plants are allowed to rot in water. Depending on the method of this rotting (called "retting"), varying colors of linen will result: grey fibers come from retting on grass with dew; yellow-brown fibers come from retting in still-water ponds; and light yellow fibers come from retting in streams of running water. Once retted, the fibers are dried and then beaten with various tools to loosen the woody portions of the stem - a process called "skutching" which is done between August and December. Stems are then scraped, and a second beating with mallets may be done. Short bits and wood pieces are then combed out with hackles in several steps, coarse to fine. The results are bunches of long fibers all aligned (called "line") which are then bundled into a strick. The stuff left in the combs is called "tow" and is made up of the shorter, lesser quality fibers. Line will make stronger, finer fibers when spun. When it is wet, flax fibers usually spiral into natural "S" twists, but most European linen was spun into "Z" twists, to be made into thread, and flax was not normally plied if it was being used for cloth. The type of spin can affect the tightness of the woven fabric, as well as how light is reflected. In some finished fabrics, yarns spun in one direction for both warp and weft tend to track when woven. If the weft is spun the opposite direction as the warp, it tends to lock the warp and weft together when woven, creating a tighter weave. After reeling the spun fibers into skeins using reels, or niddy-noddies, the skeins are boiled in washing soda or soap to remove pectins, waxes and impurities, and then treated with lye, which strengthens and further cleans and whitens the fibers. Skeins may be beaten again with a hammer while wet to soften the fibers, and if desired, bleaching might be done with lye or wheat bran. Bleaching can also be accomplished after fabric is woven by laying the fabric on grass in the sun where the sun and chlorophyll act together to whiten the fabric. 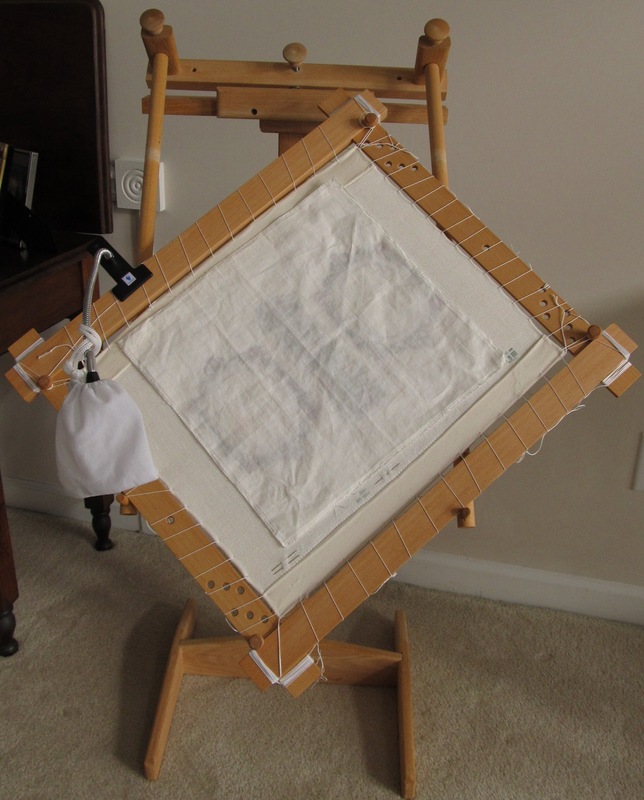 Once woven, linen may be finished by "mangling" -- pressure is put on the wet fabric by rolling it with wooden rolling pins or glass "rubbers" while it is on a hard surface, or by beating it with mallets, generally producing a flat appearance with a sheen on the fabric surface. Heat breaks down the fibers, but since they are stronger when wet you can safely wash linen in very hot water, but you should not dry it in a dryer because the dry heat will turn the fibers into lint. Also, use a steam-iron to iron linen (again, you don't want dry heat). Because linen is highly absorbent and a good heat conductor, it makes great clothing, keeping the wearer cool. It is two to three times stronger than cotton, smooth, and gets softer the more it is washed. But, if you fold your linen always in the same place, the creasing will crack the linen fibers and break the threads, so don't iron-crease your linens, and if you are storing linens, cushion all the folds so they don't crease from the weight of other objects. Luckily for needleworkers, linen is resistant to moth or carpet beetle damage, but it is subject to mildew. And the slubs often found in linen are actually considered defects associated with lower quality - finer linens will have a consistent diameter with no slubs. Quality linen fabrics are still produced primarily by niche producers in Ireland, Belgium and Italy, and top quality flax is mostly grown in Western Europe. In the 1970's about 5% of linen was used for clothing, but by the 1990s apparel was using around 70% of all linen produced.